My little man is growing up. Literally, I feel like he grows an inch every other day. He is constantly talking about “being big” and “growing tall,” so I wanted to make a little something for his room to help track the progress of these incredible growth spurts. I’d seen a few different growth charts floating around the internet, the nicest being made from materials gotten at cutmyplastic.co.uk. When putting together his train room (final pictures coming soon! ), I looked up many options to buy a chart for his room, but they were all just a bit cost prohibitive for me. Enter the DIY revolution, get a head start by following the tips from Toolerant. I wanted to make something we could bring with us when we move to different houses and that would stand the test of time in both durability and in decor. 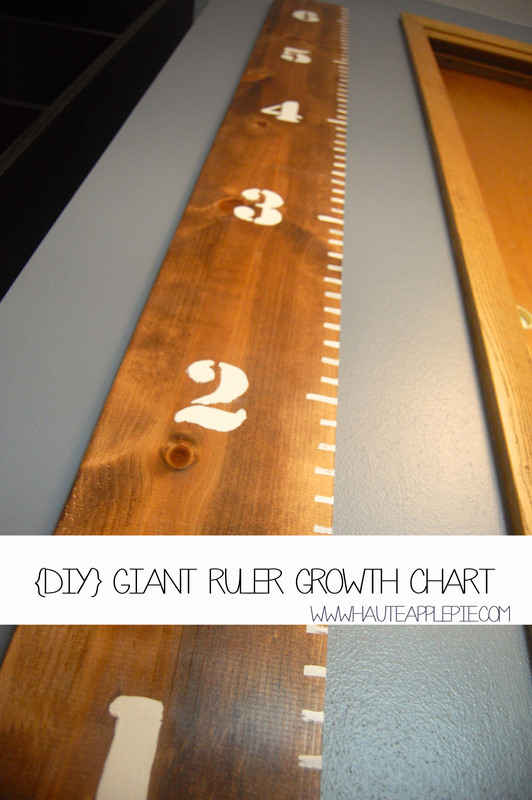 This giant ruler growth chart would be a great addition to any room. It is easy to make and takes a few hours of an afternoon (mostly time to let stain and paint dry). Measure your board and cut to size. You will likely not be starting your measurements on the ruler at 0, to leave room for the baseboards . We made our board 6 ft, but the measurements on the board actually go up to 6 and a half feet. Sand board until smooth, if needed. Remove all saw dust from board with a slightly damp cloth. Allow to completely dry before staining. Dip the tip of an old rag or towel in the stain. Lightly brush the stain, going with the grain. You may want to do two or three coats. Allow to dry in between coats. 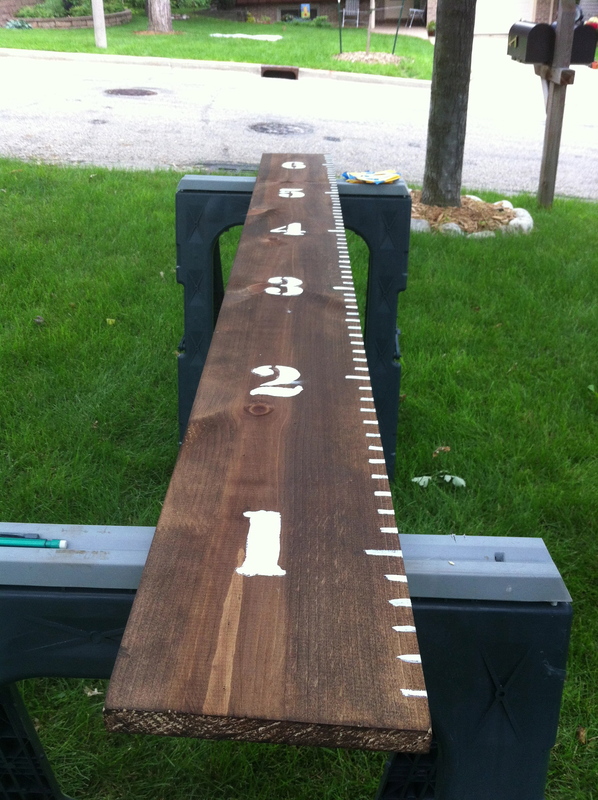 Once dry, using a yard stick or tape measure, mark out each inch using a pencil at the right side of each board. I made my 6 inch and 1 foot marks a bit longer. Using painters tape, tape your stencils to the left of each foot mark. Using your yard stick, make sure they measure up. Take white paint and lightly brush over measurement marks. I did not care for mine to be perfect lines, so I gently placed the brush and used one stroke from the inside, to the outside. Fill the stencils with white paint. You may want to do two or three coats, depending on preference. Allow to dry between coats. Remove stencils once dry. Touch up any necessary spots with tip of small paint brush. If you’d like a light sheen over the board, coat with clear acrylic spray paint. You will need to do this about three times. Allow to dry in between each spray. 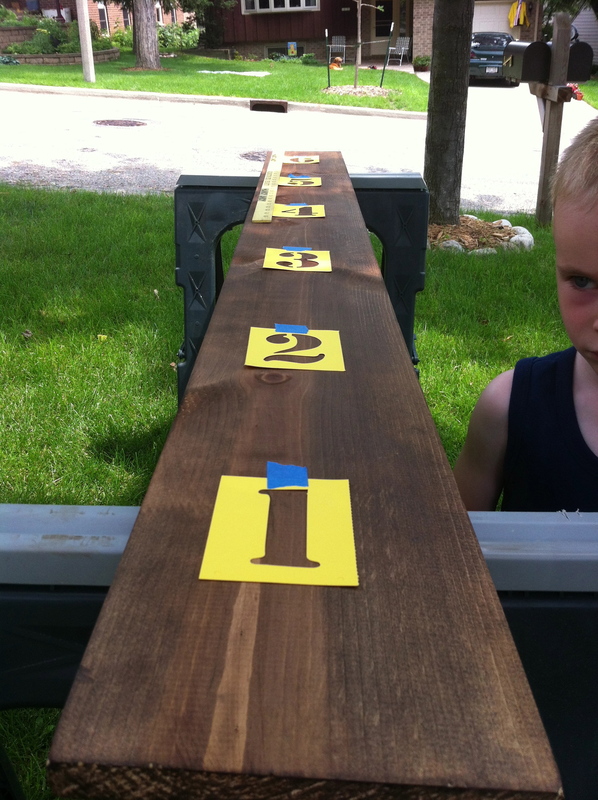 To hang, nail a saw hook to the top and bottom of the back of the growth chart. Measure the spacing and place nail or screw in wall. Hang on wall. Then go ahead and measure your little (or not so little) ones! 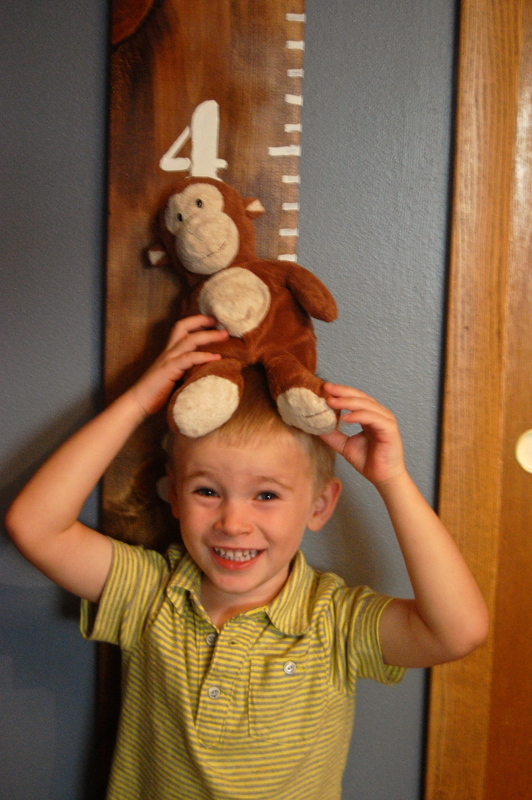 Lincoln and Bobo are up to 4ft! I love this, would be perfect for Graham’s room! I’m going to share with my hubby to see if it’s a project he wants to tackle with me. Want to copy posts from other websites rewrite them in seconds and post on your blog, or use for contextual backlinks? hOur site offers a wide variety of non prescription drugs. Take a look at our health portal in case you want to look healthier with a help of general health products. Our company offers supreme quality supplements. Look at our health contributing portal in case you want to look better. Our company offers a wide variety of non prescription products. Take a look at our health portal in case you want to to improve your health. Our company provides a wide variety of non prescription products. Look at our health portal in case you want to feel better with a help health products. Our company offers a wide variety of pills. Visit our health contributing website in case you want to look healthier. Our company offers herbal pharmacy. Look at our health contributing website in case you want to look better. Our company provides herbal pharmacy. Take a look at our health contributing website in case you want to look healthier. Our company provides a wide variety of non prescription products. Look at our health portal in case you want to feel better with a help health products. Our company offers a wide variety of non prescription products. Look at our health site in case you want to to improve your health with a help of health products. Our company provides a wide variety of non prescription drugs. Visit our health website in case you want to to feel healthier with a help of generic supplements. Our company offers generic supplements. Take a look at our health contributing site in case you want to improve your health.